Soooo, this was a pretty hectic year. What with the relocation to Switzerland and all. Internally within Oracle I submitted two talks of my own for consideration to JavaOne 2014, plus one together with Oleg Mazurov. They were all internally accepted within Oracle to be submitted to the JavaOne 2014 conference call for papers. Guess who forgot to actually submit the talks? Yep. That said, all is not lost. Oleg did not forget to submit the one I will be co-presenting with him. 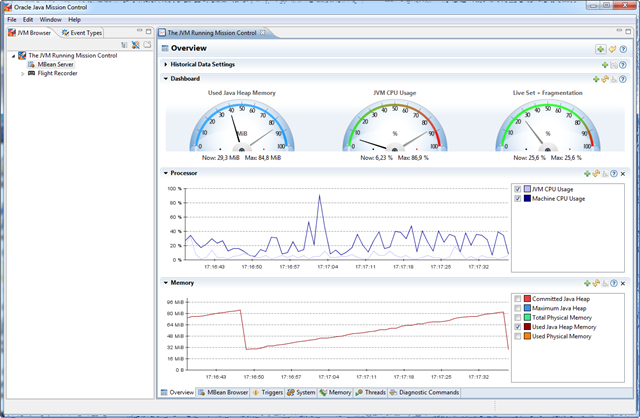 Publishing a JMC tutorial on the Mission Control home page. Publishing it by the end of JavaOne. Making it more comprehensive than the HoL I was planning for JavaOne. I’ll say something on my twitter when the tutorial is available. 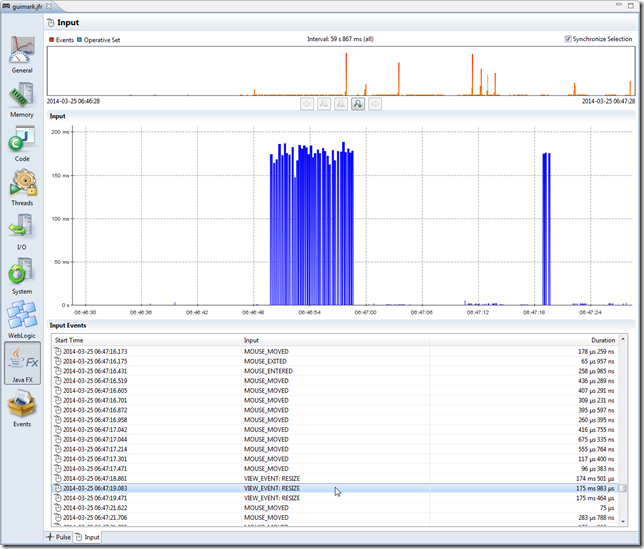 Java Mission Control 5.4.0 Released! 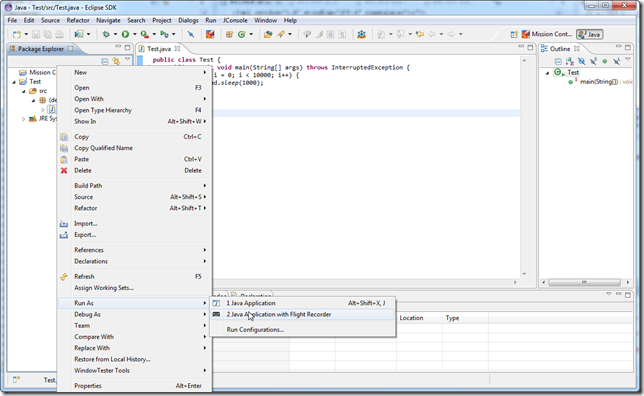 Two new plug-ins were introduced with JMC 5.4.0: the Java FX plug-in and the Eclipse IDE launcher plug-in. 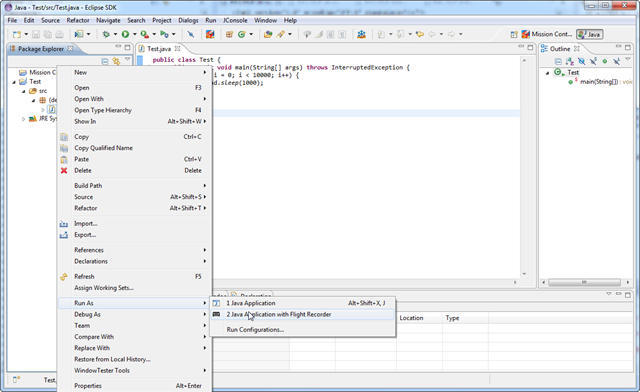 The Java FX plug-in can be installed in both the stand alone and Eclipse plug-in version of JMC, whilst the launcher plug-in is only available for the Eclipse plug-in version of JMC. 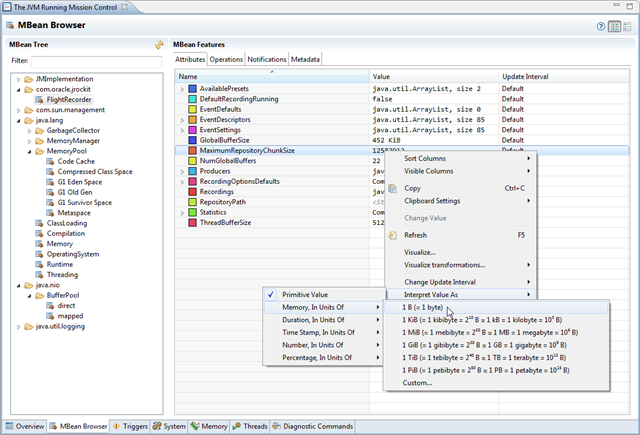 In 8u20 Java FX integrates with the Java Flight Recorder, producing events about Java FX pulses and input events. 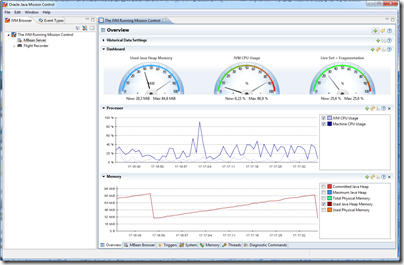 With JMC 5.4.0 there is an experimental plug-in that can be downloaded into JMC which provides custom visualization for these events. Using the plug-in, you can quickly look at the pulses and see how much time was spend in the different phases. 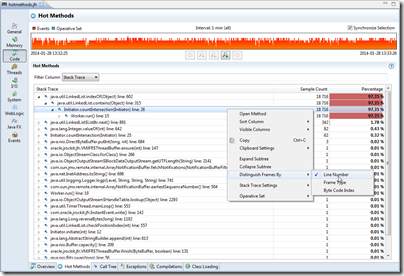 The launcher integration plug-in makes it easier to run your applications from within Eclipse with the Java Flight Recorder enabled. 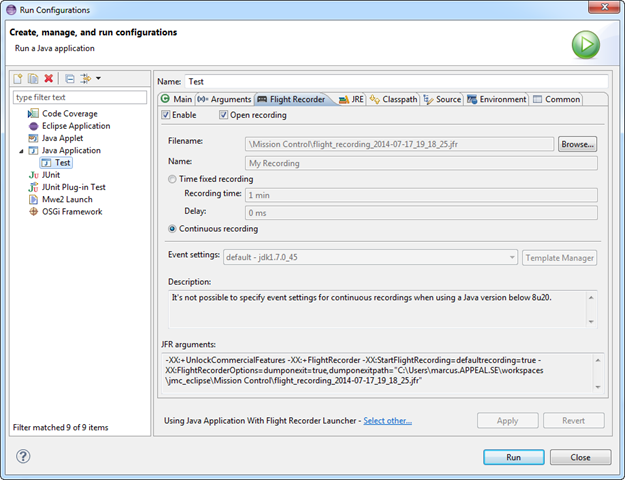 A new alternative is added to the “Run As” menu when the plug-in is installed – Java Application with Flight Recorder. A new launcher alternative will be available, “Java Application With Flight Recorder”, which adds an extra tab in the Eclipse Run Configuration dialog to help you launch your Java application with a flight recording running. 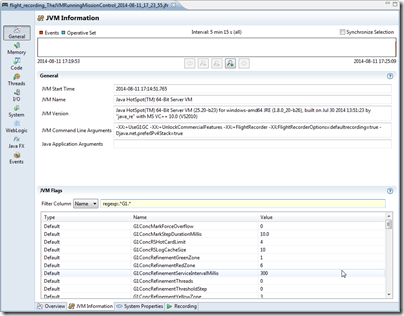 At the bottom of the Flight Recorder launcher tab you will see the JFR related arguments that will be added to the VM arguments to make it all happen. You can now select how to aggregate method frames in stack traces, either by method (default), line number or by byte code index (or any combination). 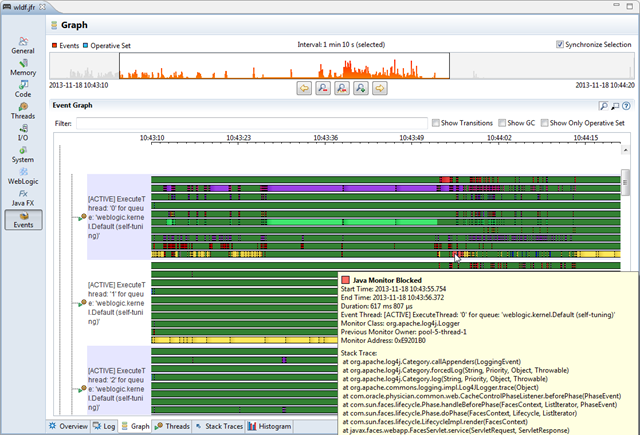 When you choose line number, you will now see the line numbers in the stack trace view. For BCI the recording must have been created with 8u20 or later. 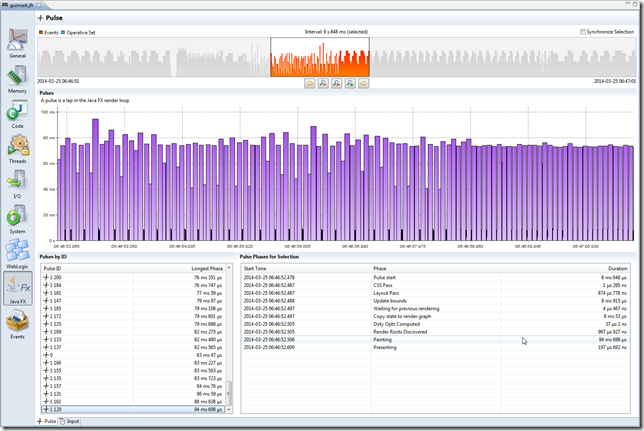 The dump JFR trigger action no longer requires a default recording to operate upon. Any ongoing recording will do. 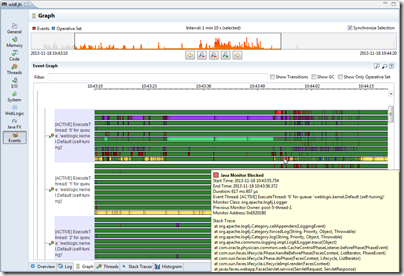 Using ctrl+mouse wheel in the thread graph in the Flight Recorder UI to zoom, will now zoom towards the mouse pointer. JMC will now choose the stronger AES/SHA-2 cipher over triple DES/SHA-1, if available, for PBE. 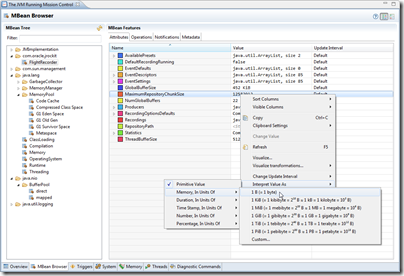 In 5.3.0 a new content type system was introduced. 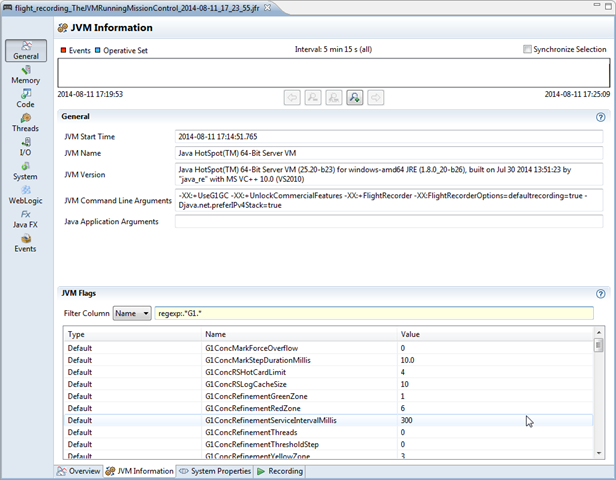 It is currently only used in the JMX console, but will be used all over Mission Control in 6.0.0 and later. The content type system associates a value with its physical quantity and unit of measurement, making it possible for JMC to render the value better and for the user to input values in a much more convenient way. 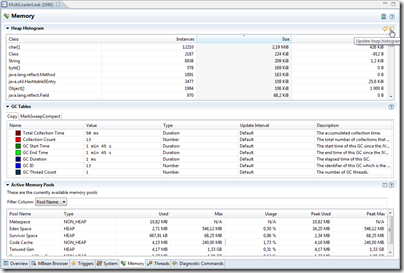 For example, in the Memory Pool MBeans it is possible to set a usage threshold. Previously a (usually) very long number stating the number of bytes would have to be entered. Now that value can be entered with whatever unit you please. 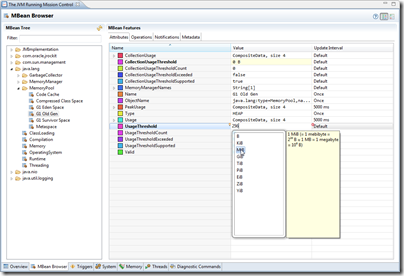 Attributes that have no physical quantity and unit specified can have one set by the user. The best would of course be if there was a standardized way of adding this metadata to the MBean attributes themselves, instead of (only) to the JMC JMX console. We hope to include such metadata in the JMX spec in the future. Also in 5.3.0, the console tab groups and tabs were redistributed and normalized, so that no tab groups would need to be visible by default. Installing plug-ins may make the tab groups area re-appear. 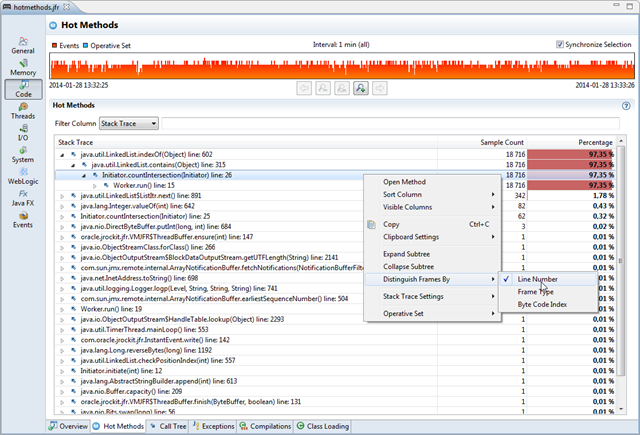 In 5.3.0 there was a new context action introduced for copying stack traces to the clipboard (JFR). 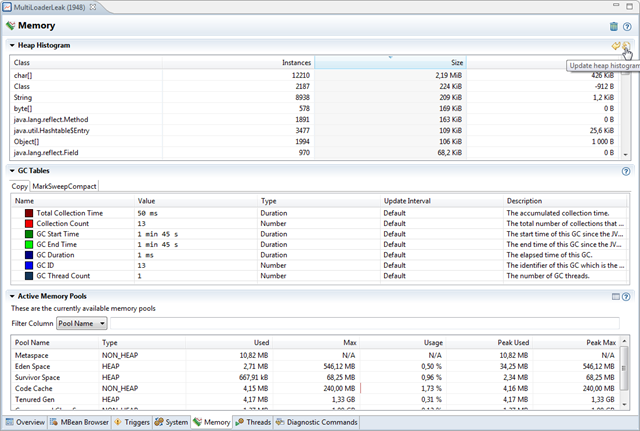 There was also a new user interface introduced showing the VM flags (JFR). 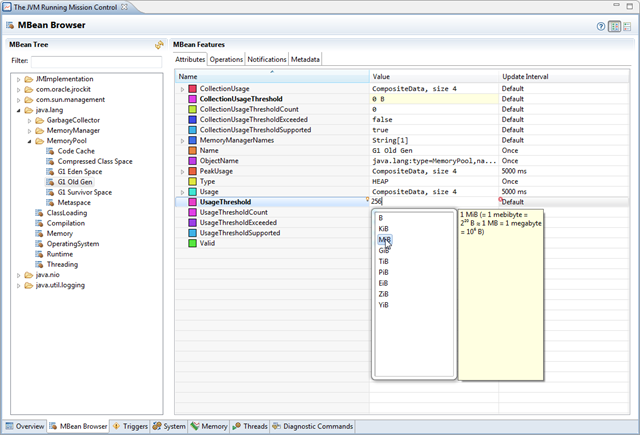 Attributes with the same update interval and on the same MBean are now fetched at the same time to minimize roundtrips. 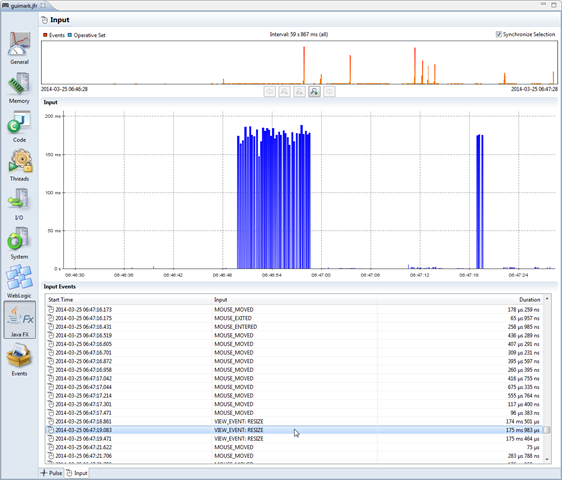 In the memory tab, there is now the possibility to take heap histograms. Note that you need to be connected to a JDK 8 JVM for this to show up. 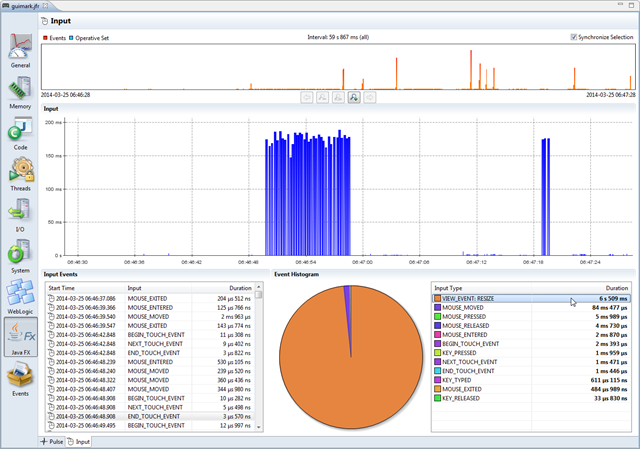 Click the Update Heap Histogram button to take a new snapshot. The difference between the two last ones will be calculated and shown in the Delta column. The dropins folder now works as expected. To install a plug-in, it can simply be dropped into the JDK_HOME/lib/missioncontrol/dropins folder. Installing experimental plug-ins in a shared installation now works. Previously installing plug-ins in a shared installation could fail silently. JMC and JFR did not agree on how to specify some time units, making it impossible to use recording templates containing time values specified in minutes interchangeably as server side and client side templates. Fixed. JMC no longer hangs when starting up on Mac (due to an SWT/Swing interop problem on Mac OS X – we have a workaround). 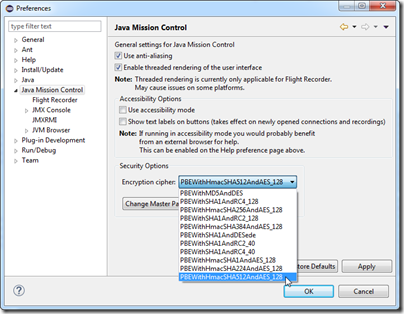 There is a new version of Java Mission Control available now – JMC 5.4.0. It is shipped with Oracle JDK 8u20. It is also available as a set of Eclipse plug-ins. Even though most of the development effort is put into the next major version of JMC, there are lots of useful new features and bug fixes in these incremental releases.